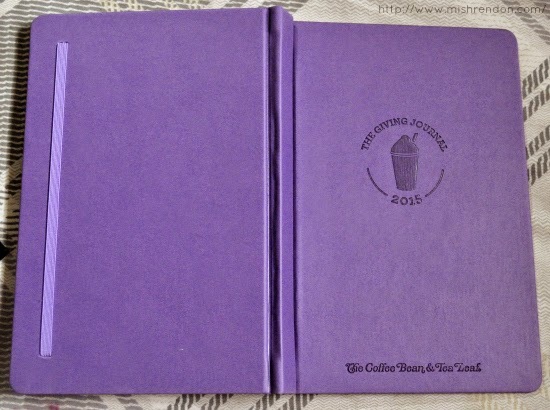 The journal comes in vibrant and fun colors such as brown, green, orange, and purple symbolizing the different drinks CBTL has to offer. 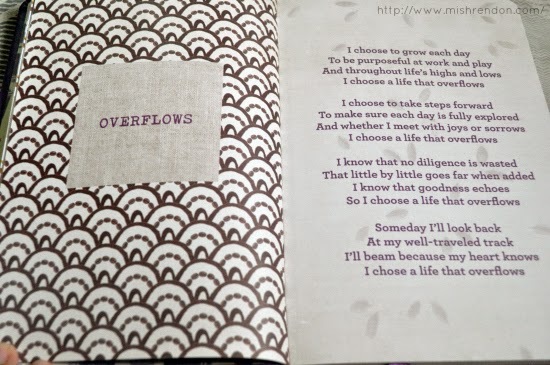 It also comes with a sleeve which is perfect especially if you are getting a planner as a gift. 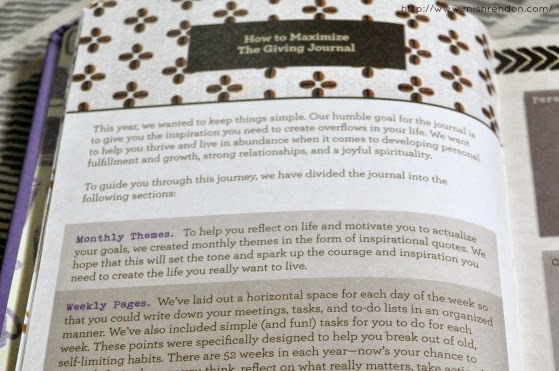 As I have mentioned in a previous blog post, the theme of the Giving Journal 2015 is to provide the inspiration to create OVERFLOWS in one’s life. The Coffee Bean & Tea Leaf desires for all of us to thrive and live in abundance when it comes to developing personal fulfillment & growth, strong relationships, and a joyful spirituality. 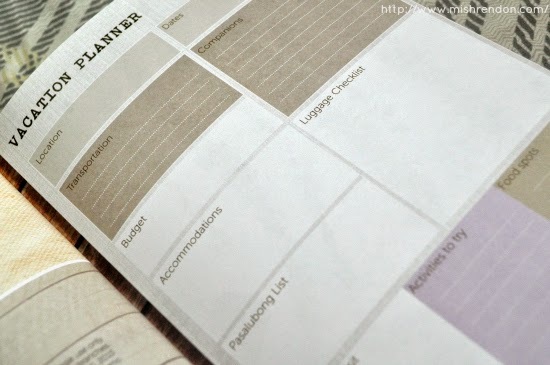 Another feature I have noticed in the journal is a vacation planner. I believe that this is perfect in line with their Overflow theme. 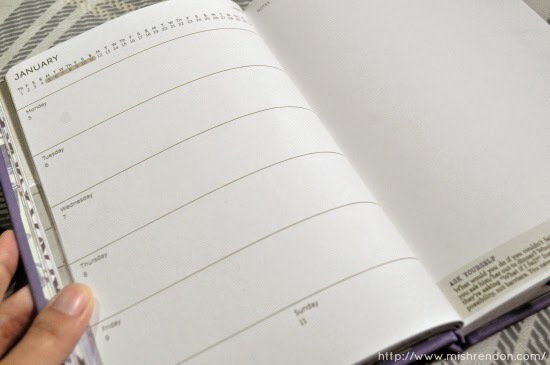 The journal has a monthly and weekly view of the calendar. What I love most about the weekly view is that it has the entire opposite page for notes. I find it really convenient for reminders that won't usually fit in the space allotted for each day. 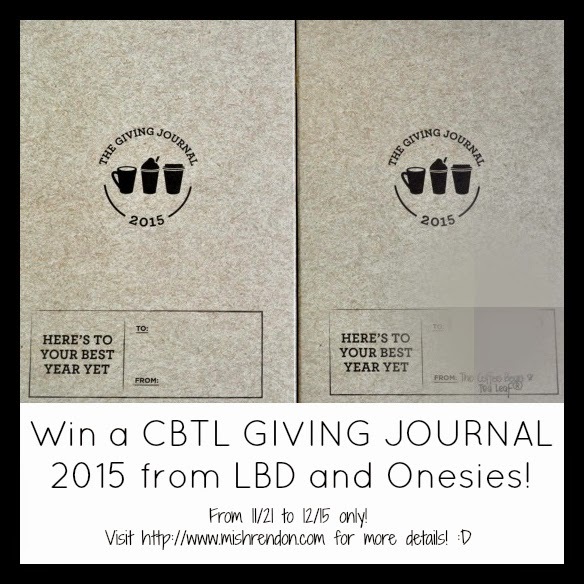 Since I was already given a Giving Journal and I finally completed a stamp card at the same time, I'll then share the BROWN CBTL GIVING JOURNAL 2015 I have redeemed to one lucky winner! The giveaway will run from 11/21 until 12/15 only. The winner will be chosen through random.org. The winner will be announced on my FB page and blog. I'll make 2015 my best year yet by finally pursuing interests that I've been having for quite awhile. 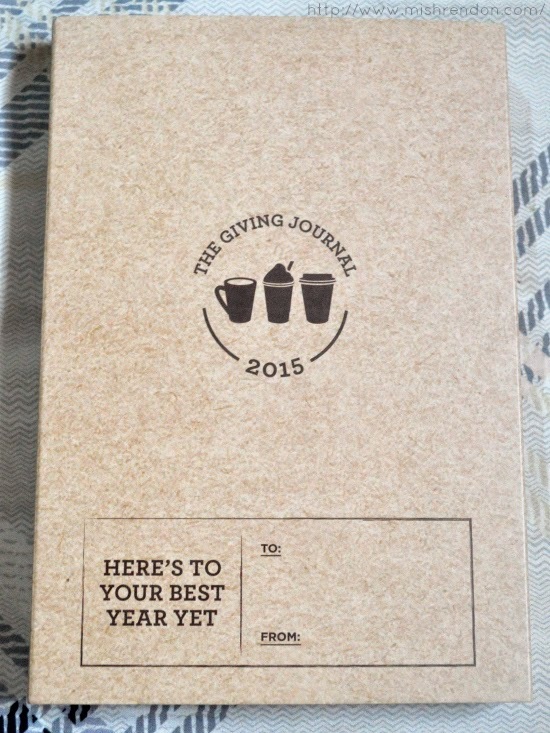 I finally have a great opportunity and with so many ideas and plans the Giving Journal will be perfect for what I have in store next year. 1st: being a more responsible daughter to my mom and a more mature mother to my little kid. I'll make 2015 my best year by trying my other interest in serious mode - DIY crafts and hopefully start an online business. I will make my best year 2015 by cultivating new interest and investing money in mutual funds and stocks. I will try to enroll in a short course probably in digital marketing for me to headstart my planned blog. I will make 2015 my best year yet as i make my relationship with God and my family deeper and more personal. 2015 will be my best year yet! by living each day to the fullest with my son and husband, embracing each day's possibility with positive thoughts and energy! I will rock 2015 like there's no tomorrow. I will strive more and always put my best foot forward in pursuing my career to the point that i can handle things on my own with / without minimal supervision. I want to explore the world more and open up my mind to its beauty. Plan for a family European tour on 2015! As for me i will make 2015 the best year because im gonna now fulfill my dream to work abroad,to be able to raise my kids alone and aim for success! More winnings especially staycation, etc. Keep motivated everyday and set goals! 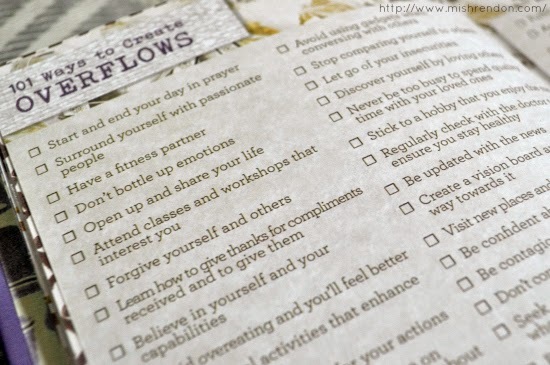 I want to accomplish all my goals this year!! I want to work harder and travel more. 2015 will be the start of my career! I just got hired and started my training this November. 2015 will be my best year because I am celebrating my independence and can finally start having a job! I recently graduated and passed a board exam so 2015 will be a stepping stone for my career. I definitely wanna win this because as a social activist and someone active online this would help me a lot. I will make my 2015 my best year by not dwelling on my problems, mistakes or shortcomings last year. I will try to be more positive in the things that will happen in my life. I will also pray and give thanks to everyday blessings in my life. I will make 2015 my best year by pursuing my dreams and doing the things I love. 2015 will be my best year because I know God will be always be with me every step of the way. 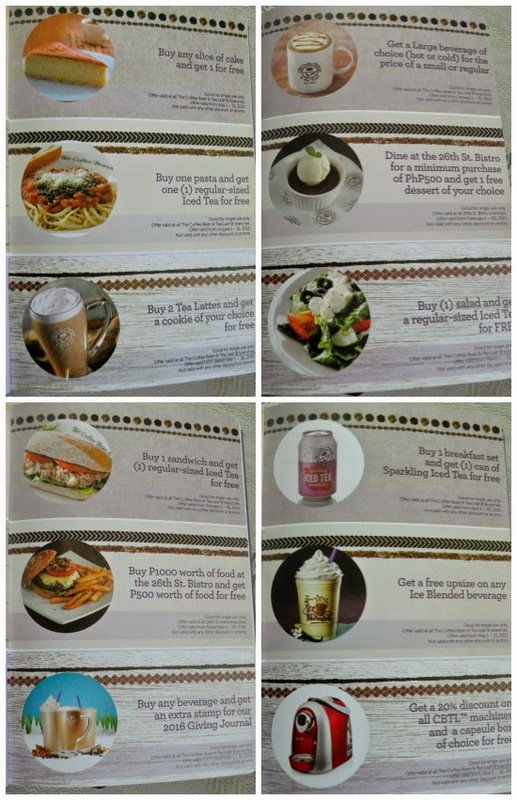 I will really lose weight this year! Yeah! By taking my mom out of the country for a vacation. It will be her first time and I want it to become memorable for both of us. I have been planning the whole of my 2015. And I think that's the best way to make the best out of 2015. 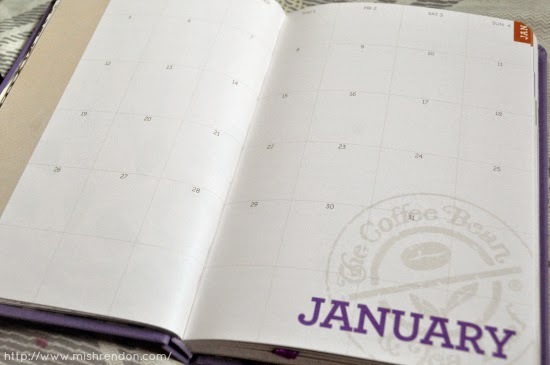 I will make 2015 my best year yet by renovating my food blog! I will make 2015 the best year by passing the defense for our feasibility study so that I'll graduate on March 2015 Yay!!! To be the best Dad for my Son. :) aside from that I want to marry a lawyer. :) be Good to me 2015. God bless. I will make my 2015 the best year ever by forgiving my mom... 2015 be good to me!!! Hurray!!! 2015 will definitely the best year for me and for the people surrounding me. By being focus and staying positive in everyday life and just by being good to everyone definitely days will come the best. I will you make 2015 the best year yet by doubling my effort in everything I do.